First Call - 802 488-7777 - Crisis intervention and response for children, teens, and parents, provided by Howard Center’s First Call for Children and Families. U Matter - U CAN help - Providing information for those worried about a loved one and needing information on how to help. 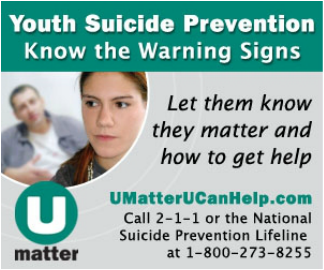 U Matter - U CAN get help - Providing resources to help keep you safe. Vermont Suicide Prevention Center is dedicated to ensuring that people of all ages have the knowledge, attitudes, skills and resources to reduce the risk of suicide. The goals of suicide prevention are to help the person understand that you care, there are alternatives to suicide, they can get safely through the crisis and that you can help them seek available resources. How Should I Respond to Suicidal Behavior? What Can I DO When the Need is URGENT?